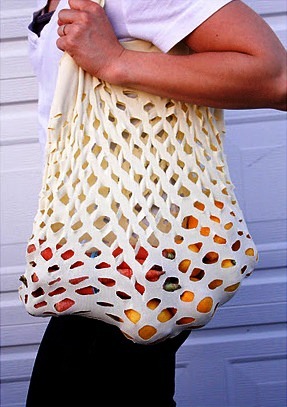 Avoska - the spoken name woven fromA rope of a mesh shopping bag with which it is convenient to visit stores. In the Soviet Union, when almost everything was in short supply, people just in case carried it always with them - maybe they could buy something on the way home or at lunch time. After folded, the bag - an avoska with its own hands occupies very little space, so it is convenient to carry it in a small purse or pocket. Now they are rarely used, they are replaced by plastic or paper bags. 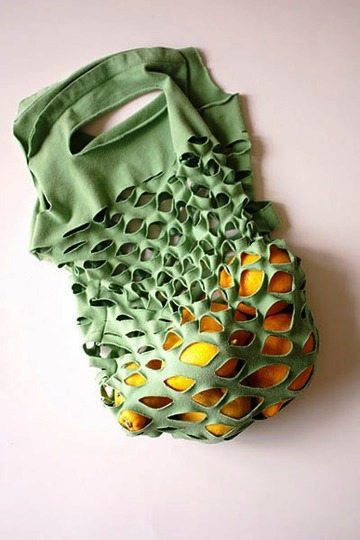 Nevertheless, if you still appreciate the convenience of the bag, we offer a simple master class how to make a pair of such bright retro shopping bags of old knitted t-shirts with your own hands! Carefully refer to the choice of T-shirt, fromWhich will make a string bag. The fabric should be elastic, but do not let "arrows" when you make a lot of cuts on it. The width of the string bag can be equal to the width of the T-shirt. If you want to make it more narrowly, you will have to make one more seam or we recommend taking a children's t-shirt. Turn the t-shirt inside out. Mark the height of your bag with small, pencil or pins. Cut off the excess. Securely sew the bottom of the bag and one side (in case the bar is smaller than the T-shirt). Turn the bag to the front. By pins, we split both sides together and sharpScissors or a stationery knife make small incisions. For the handle, make one large incision at the top of the string bag. To ensure that the handle is comfortable and does not tear under the weight of the products, you can additionally lay it with a dense cloth, synthetic tape or rope and stitch it. 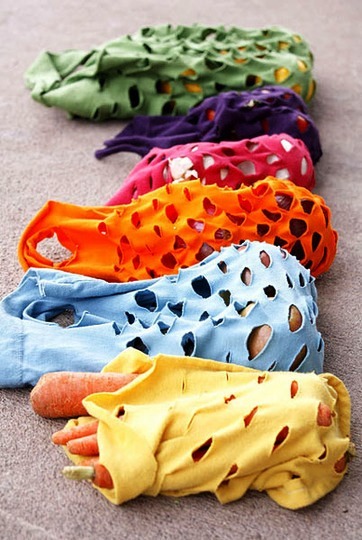 A wonderful way, with the benefit for the cause, of giving a secondLife unnecessary old T-shirts! Yes, and you will look very original, going home with purchases. Not like with ordinary and non-ecological plastic bags.